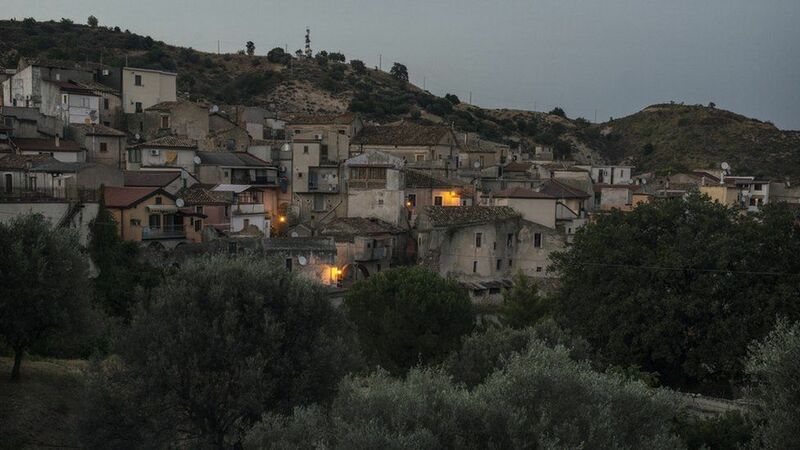 Last month I was in Italy, where summer had steamed in early and politics had moved into operatic extremes of drama and imbroglio only slightly leavened by farce. Finally running the new coalition government are the boy wonder of the Five Stars populist movement, founded by a comedian, and the head of the proto-fascist League, who is no longer a joke. The two chose as the new premier an amiable law professor with a CV padded by drive-through sojourns at prestigious universities in Europe and the U.S. 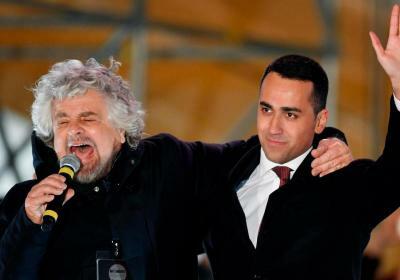 While peculiar politics also reign in my own land, in Italy we tend to see their aberrations as a familiar comedy rather than a dark threat to the survival of the planet. Hard to remember that our Yankee republic was founded almost a hundred years before the bickering regions of the Italian boot could be laced together. At least Italy’s revolution was accompanied, if not actually orchestrated, by music—with Giuseppe Verdi as its figurehead. Verdi’s poignant chorus from Nabucco, “Va Pensiero, sull’ ali dorate,” sung by homesick Hebrew slaves, has come to symbolize the patriotic fervor that led finally to Italian unification. 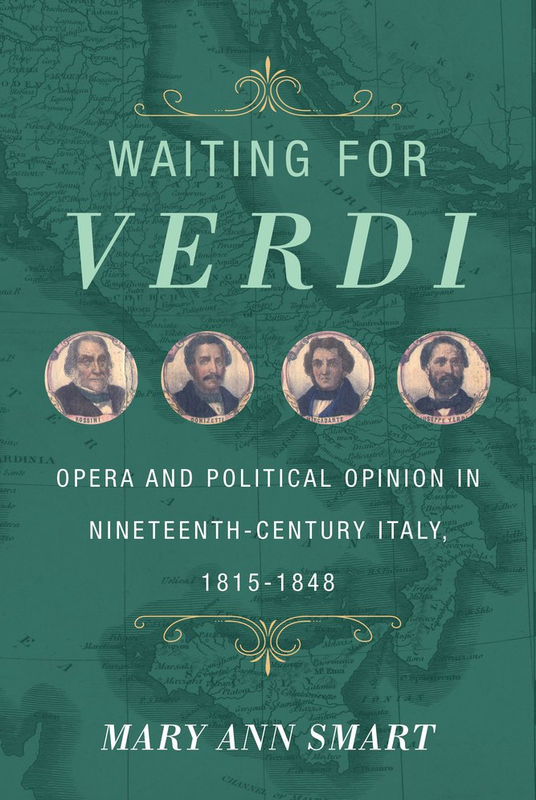 Waiting for Verdi is the title of a long-awaited new book by Mary Ann Smart, a music historian who writes brilliantly about opera and society. The title clearly contains an ironic reference to Samuel Beckett’s play, but also to the high anxiety shared by struggling Risorgimento patriots, artists and revolutionaries as they struggled toward Unification. 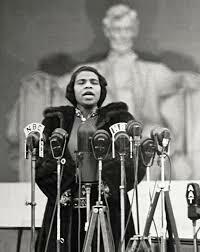 Thus the Metropolitan Opera debut of the sublime contralto Marian Anderson, in 1955 the first African-American to sing there. Nabucco was also playing at the Vienna State Opera when I was a student living with the family of an impoverished baron just a block from the opera house. But the concert and opera posters reminded me of periodic tables, and knowing next to nothing about opera, I went to the Richards, Wagner and Strauss, but never to Nabucco. Little did I know that it was a thrilling tale of King Nebuchednezzar, proprietor of the Hanging Gardens of Babylon, and featured madness, passion, betrayal, and wanton destruction of selected temples and gods. 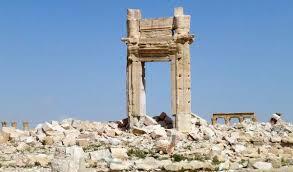 In 2015, the Greco-Roman Temple of Bel at Palmyra, 32 CE, was destroyed by ISIS vandals soon after they had beheaded Khaled al Asaad, Palmyra’s much respected chief of antiquities. The Temple of Bel, according to another archaeologist, Khaled’s friend, had actually been a kind of a monument to religious coexistence. 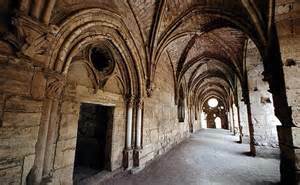 The main altar of the temple had been used for sacrifices to different gods, sometimes even side by side. The archaeologist also pointed out that ISIS had announced the destruction of Palmyra well in advance of the fact, but the international community had done nothing. 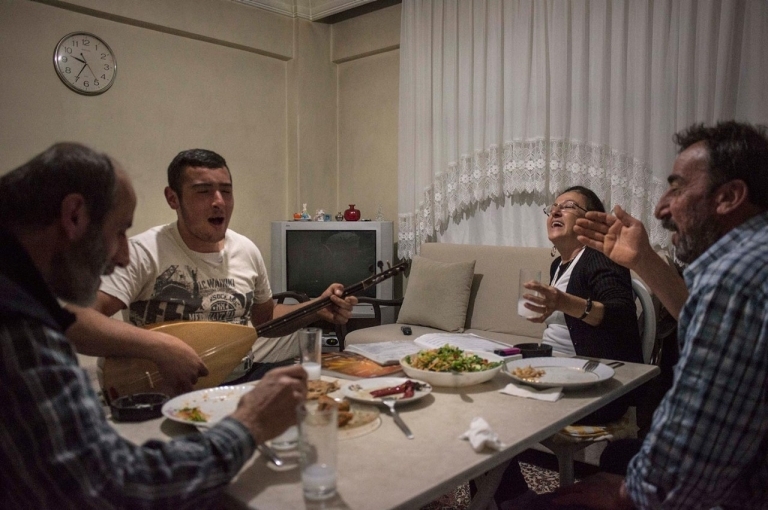 In any case, peaceful coexistence in Syrian lands is hardly even a memory. Now the best expectations are that some 75,000 Syrian refugees fleeing Daraa—where the so-called civil war began—can be sheltered in Jordan. Four million other Syrians are still homeless. Meanwhile, the tragic histories of the ancient Middle East have fueled many operas besides Nabucco. How many works of art and music will commemorate the refugee flights of this century, and to what end? For some years it has been proposed, and rejected, that Italy’s national anthem be replaced by “Va Pensiero,” the haunting Hebrew slaves’ chorus in Nabucco. Only recently it has been adopted by the far-right League, as its official hymn. Matteo Salvini and his League are committed to labeling and expelling all immigrants, including thousands of Roma who are legal citizens. Here, whatever Verdi’s politics were, we could use the intervention of the Anvil Chorus. Italian friends have been most sympathetic about our recent election. After all, they say, we survived Berlusconi. It’s not the end of the world. 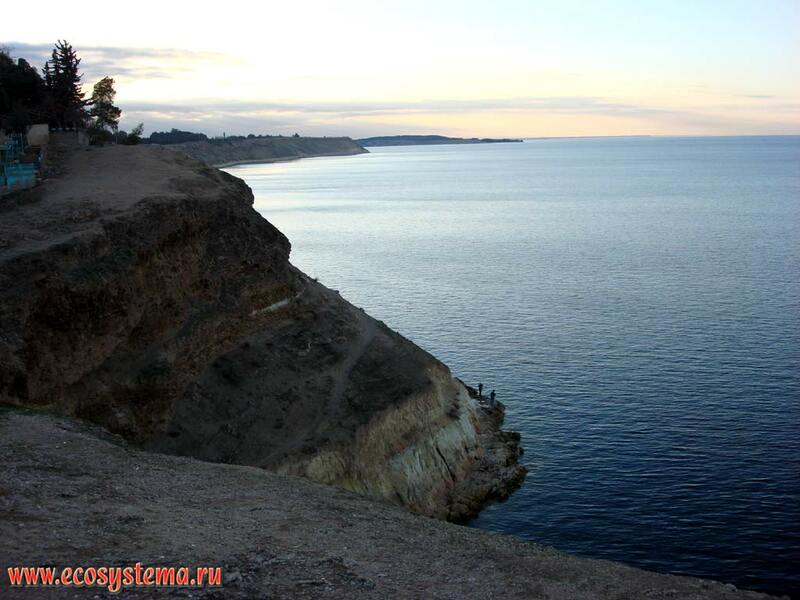 They offer us political asylum, but then say that of course we are needed in our own country. Meanwhile, we are still here to see them through their coming referendum vote on the so-called “Italicum” reform of their electoral system. Renzi has been intrepid in many ways, not least in defending the rescue and accommodation of many thousands of profughi, refugees, arriving in Italy during the current migration crisis. Renzi points out that while Italy pays hundreds of millions of euros in this humanitarian mission, most other European governments have used their euros to build walls. At a pizzeria on the Strada Nova the guy behind the counter couldn’t decide whether to use English or Italian. I suggested Cinese and we both laughed. I asked where he was born and he said Romania. He has been in Italy for fourteen years and lives in Mestre, twenty minutes away by bus on the mainland. We talked about the high rents and long commutes in Venice and California. He said he could give my husband and me one room and shared use of his Mestre apartment for 350 euros a month. I said that unfortunately we already had a rental contract through December. He said that he really wanted to learn more English so that he could get a better job, and I said that I could give him lessons if I was staying longer. I only had a 50-euro bill to pay for my pizza. He smiled and ran off with it to get change. I wasn’t really worried when he didn’t reappear for ten minutes, but it did occur to me that 50 euros was probably more than a couple of days’ take-home pay. He said his name was Nikolai, Nicola in Italian, he added. I said mine was Frances, Francesca in Italian. See you tomorrow? he said. A hundred yards on, I stopped to let a herd of school children go ahead of me across a narrow bridge. Meanwhile I went to a kiosk to get a paper with news about the latest earthquake in the Marche, and about the crises with the new refugees. The earthquake had definitely won that news cycle; there was not a word about the town in the Veneto that had barricaded its streets against the arrival of a dozen refugee women and children to be billeted in an empty hotel. Of course it was only an idle thought that Nicola and Nabis could exchange language lessons. 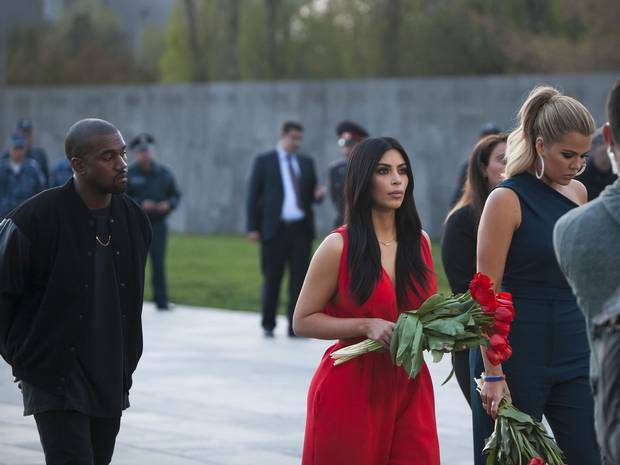 But maybe with ingenious use of cellphones and social media…some kind of networking? I had been hoping to make myself useful in the refugee crisis, perhaps teaching or translating, during our Italian stay, but that too was an idle thought. The needy refugees were not in la Serenissima, but in Mestre and smaller inland towns, Veneto, where, unfortunately, the locals are not always welcoming. In Venice the neediest refugees only come for the day trade, foreigners passing from Rialto to San Marco from cruise ship to gondola, who might need an umbrella or a carnival mask, or will drop a euro into an outstretched hand. Many constructive responses to the migrant crisis are to be found in the 2016 Architectural Biennale in Venice, too soon closing. And note that funds for housing the homeless were voted in by healthy margins–at least in California. As Italian friends tell us, we’ll get through this somehow. The siren sounded a bit before sunrise. . . a long, piercing alert, followed by a series of slowly articulated, musical ululations. Then the quiet slosh of the first vaporetto docking and departing as usual across the canal. I had been lying awake for a while, having seen the acqua alta warning the day before. Acqua alta, high water, refers to monster tides that cause flooding all around the northern Adriatic, but most famously in Venice. Between autumn and spring, the high tides can combine disastrously with the sirocco and the local “bora” winds and the oscillating waters of the long, narrow rectangle of the Adriatic Sea. 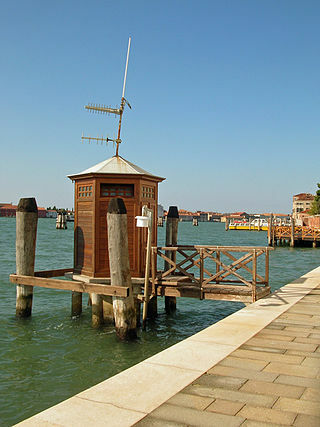 As the foundations of most Venetian buildings have been brining in the depths of the lagoon for centuries, the natives regularly take certain minimal precautionary measures. Passerelle planks are neatly stacked, ready to be laid out across flooded expanses in Piazza San Marco and other low-lying parts of the city. In our neighborhood, Cannaregio, ten metal supports for the passerelle were stolen, for what market it is hard to imagine. Tall rubber boots are ready by the door of our attic apartment, lent by our kind landlords, but they are too small for our big American feet. The first real autumn rain brought only moderate acqua alta in Venice. 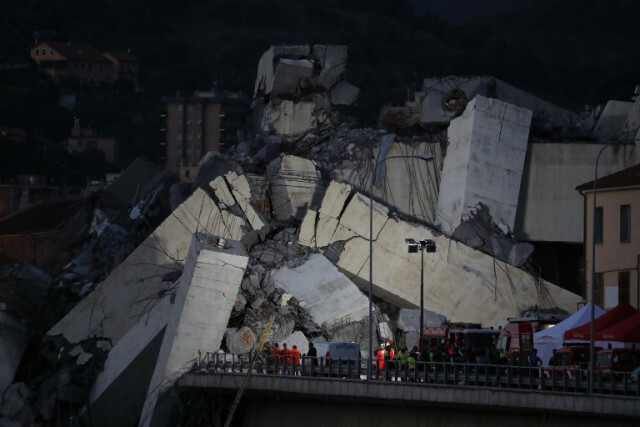 But in Tuscany the deluge submerged Massa and Carrara, below those white-veined mountains where ancient Romans, Michelangelo Buonarroti, and rich Americans and Arabs, have found an unending supply of white marble to bedeck their temples and mosques, mansions and museums. Quarry labor was always hard and poorly paid, fueling rebellions among the workers. By the end of the 19th century, Carrara was called the cradle of anarchism. 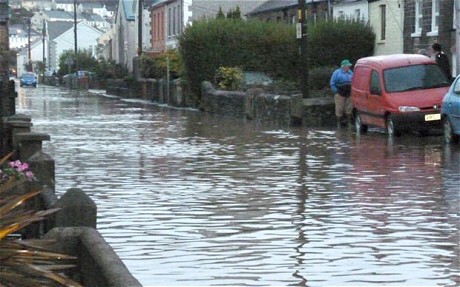 These days the flooded residents seem to be demanding some responsible governmental action, no small order in 21st century Italy. A dear friend, an art historian who helped salvage Florentine art after the great flood of November 1966, observed sadly that Tuscans have never understood how to deal with water. 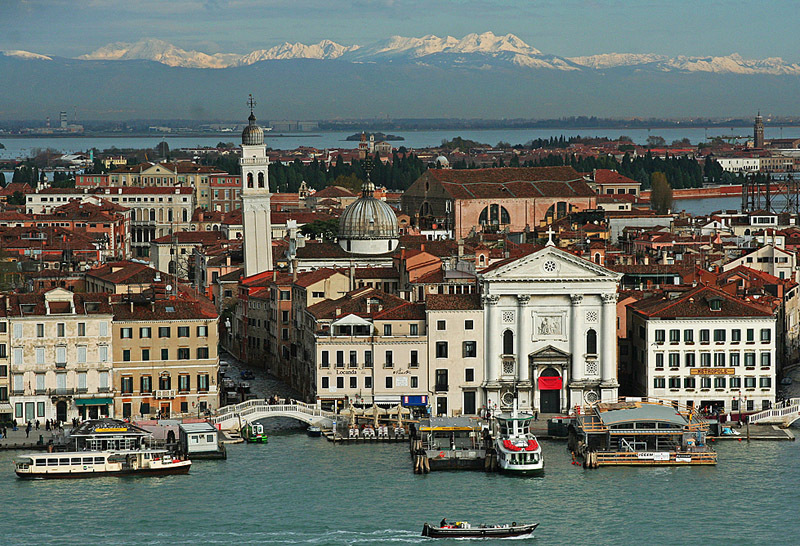 The Venetians, too, were underwater in 1966; their efforts to curb the tides have a higher profile because Venice is more obviously fragile than stony Florence. The huge MOSE project (MOdulo Sperimentale Elettromeccanico) is supposed to protect Venice and the lagoon against flooding. Note the acronym’s cunning allusion to the Hebrew patriarch who parted the Red Sea. MOSE consists of 78 mobile underwater barrier gates that rise during high tides to isolate the Venetian Lagoon from the Adriatic Sea. Approved by the Comitatone (Big Committee) in 2003 with a budget of some 7 billion euros, MOSE has so far successfully tested only four of the gates. Meanwhile, in June 2014, the mayor of Venice and 35 other “public servants” were charged with misuse of billions of the MOSE funds. The arrest of the mayor of Venice was international news, and even amid the flamboyant excesses of Italian politics, the level of corruption is spectacular. The scandal provided local color following the opening of the 2014 Biennale of architecture, which was set partly in the Arsenale, the former Venetian shipyards, first mentioned in 1104. 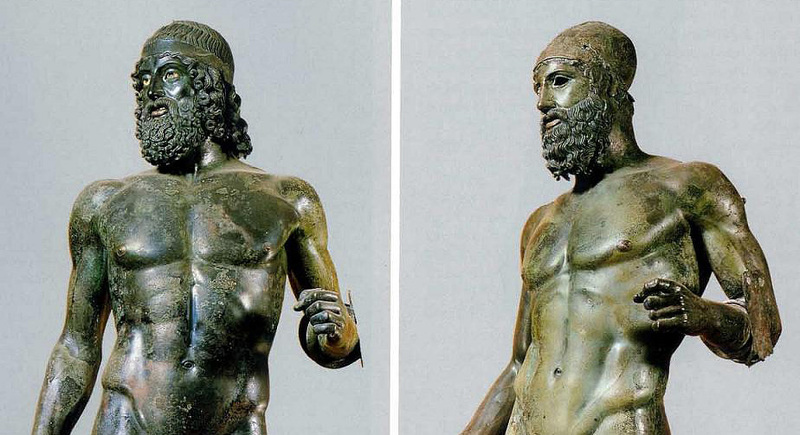 “Arsenale” comes from the Arabic “darsena” or workshop, and there were naval arsenals already in the seventh and eighth centuries along coasts from North Africa to Arab Sicily and the southern Mediterranean. 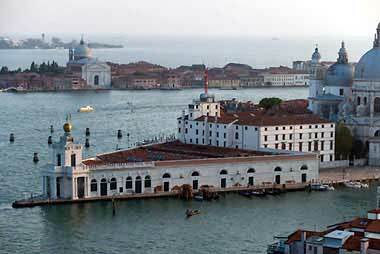 But for some four centuries, the fleets built in the Venetian Arsenale ruled the waves in war and commerce. Venice hasn’t been actively at war for some three hundred years. The grand buildings of the Arsenale now house a splendid naval museum as well as splashy international expositions like the architecture Biennale, part of which occupies the Corderie, a vast columned hall built in the 16th century, where miles of ropes were made for the ships in production. The Biennale exhibits were remarkably free of military or imperial connections, except of course for those involving the guilt, implicit or acknowledged, of modern colonial powers. Silvio Berlusconi’s melodramatic apology to Libya for decades of Italian abuse is memorialized next to videos showing footage of the most recent exploitation of Libyan oil. 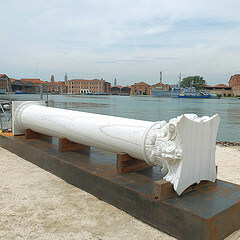 On the Arsenale embankment is a recumbent classical column that is connected with the Biennale’s Albanian exhibit. 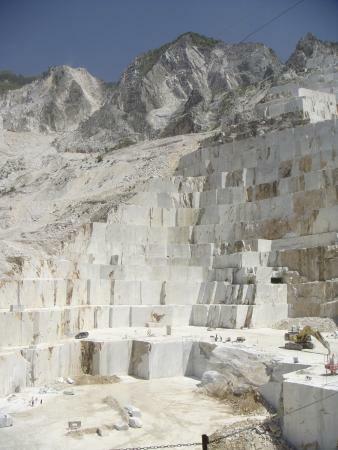 A documentary by Albanian exile artist Adrian Paci shows the quarrying of the marble block in China, its loading onto a freighter, and to cut costs, three Chinese carvers working the marble en route on the high seas. Paci thus addresses what we might call the downside of global trade and labor. 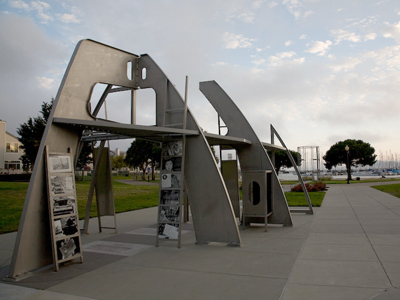 During the Second World War, the shipyards in Richmond, California, were the most efficient and productive of any in the country. 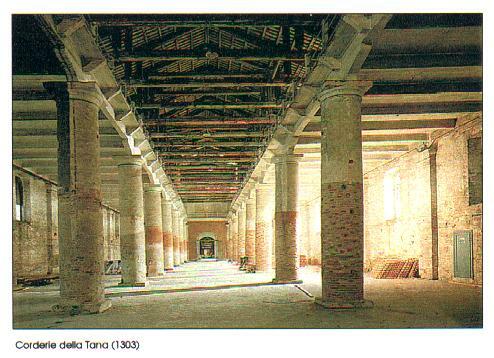 Huge buildings, on the same scale as the Venetian Arsenale, enclosed the assembly lines which had been pioneered by early Venetian shipbuilders. In Venice the workers, the arsenalotti, were respected and paid well. The Richmond shipyards employed tens of thousands of unskilled laborers fleeing the depressed South. Rosie the Riveter was a familiar icon of the spunky female worker. 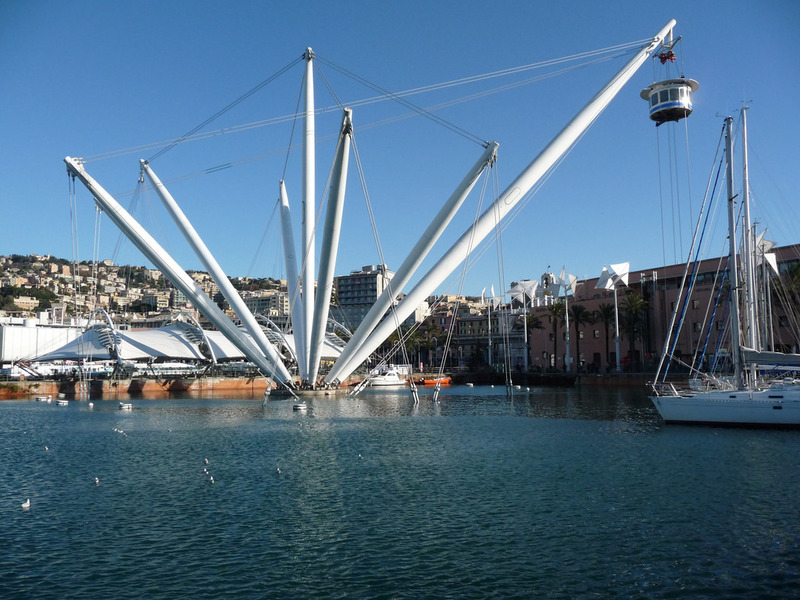 The docks and warehouses now house restaurants & theaters and light industry. 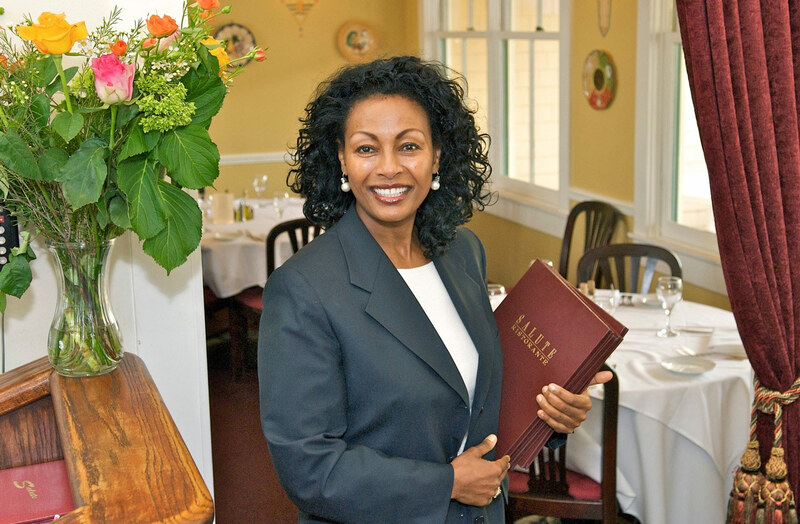 An Italian restaurant, Salute e Vita, in a Cape Cod Victorian said to have been the Richmond harbormaster’s house, is now owned by a beautiful woman born Ethiopia and raised in Rome in a family of restaurateurs. Menbe now dispenses Thanksgiving charity to the hoi polloi of the real city of Richmond, many of whose grandparents came from the depressed South to work in the wartime shipyards. Richmond now has the highest rates of unemployment and violent crime of any city in the Bay Area except Oakland. Property values were so low that developers could profitably produce a town-house development along the waterfront and even offer some public amenities, little beaches and a smart interactive memorial to Rosie the Riveter. 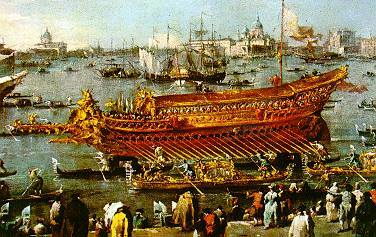 In Venice, every year after 1177, the doge sailed out into the lagoon on a seriously over-decorated ship called the Bucintoro, and tossed a ring into the waves to symbolize Venice’s wedding with the sea. 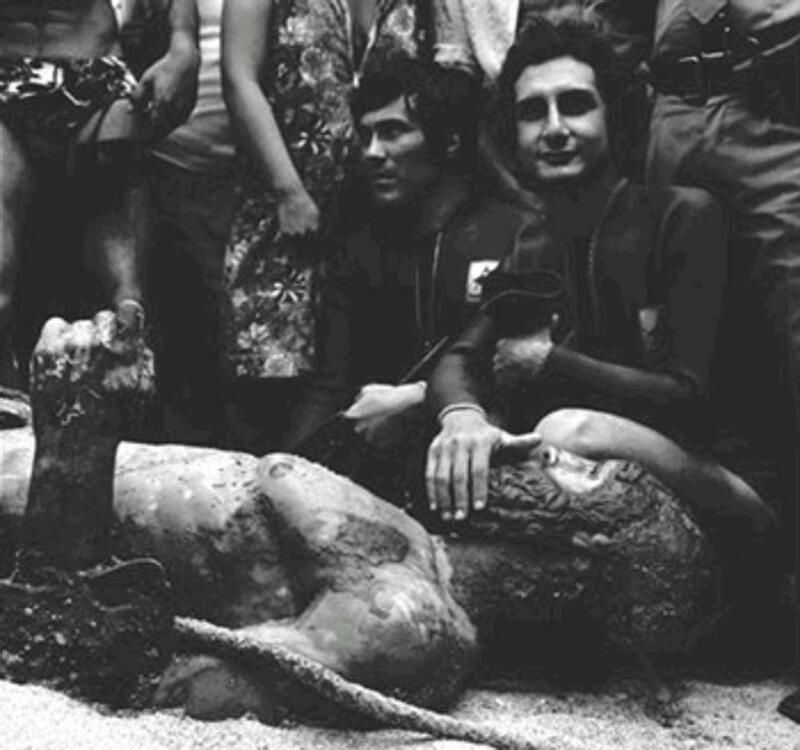 After Napoleon had carried off the Lion and Horses of St. Mark and the choicest artworks in the city, the French set the last Bucintoro afire where all in the city could see it burn, on the island of San Giorgio Maggiore. And there the canny French sieved the ashes to save the gold. 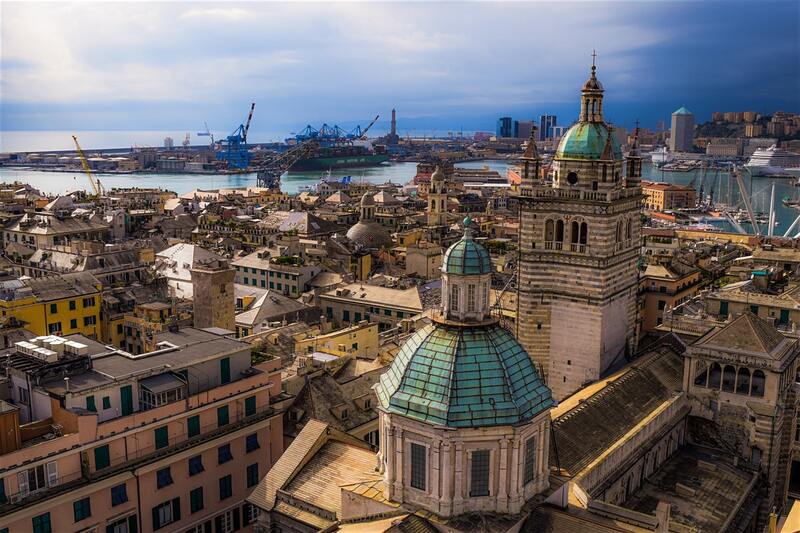 There is also the escalating risk that Venice will lose its historical and cultural identity not through tourism but under the invasive tides of the Adriatic. The earliest acqua alta, in 579, was reported two hundred years later by Paul the Deacon, a Benedictine monk-historian. The event, known onomatopoetically as the Rotta della Cucca, was a calamitous rupture of river banks in the Veneto. This collates with variously reported global climate changes in 536-538, confirmed by tree-ring chronology. The probable cause was a volcanic event that created a dust ring around the planet, darkening the sun and aborting harvests. The ensuing famines and civil unrest could explain many gloomy global developments, from the sudden decline of Teotihuacan to the Plague of Justinian, and the westward Mongol invasions. 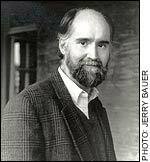 In fact, this catastrophe theory, advanced by journalist David Keys, was so expansively interesting that it was quickly discredited by qualified academics—but not before public television documentaries that you might have missed, as I did. 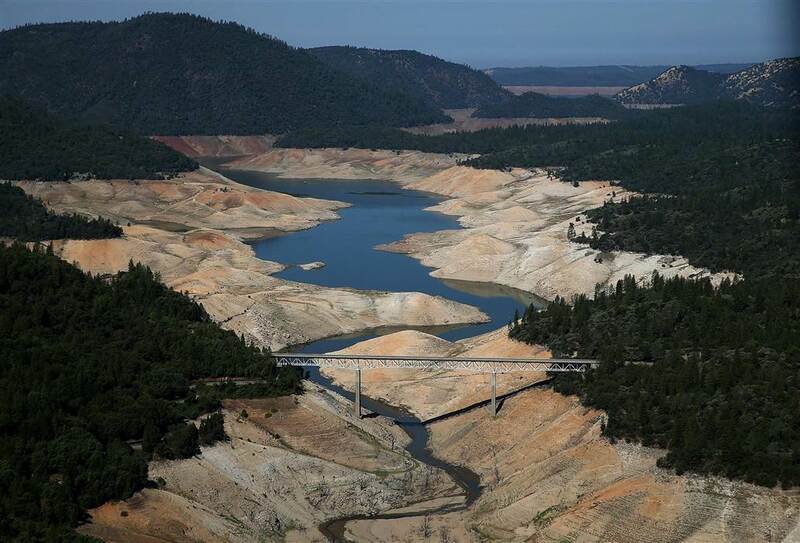 Catastrophe theories aside, it must be conceded that recent western technology, no matter how advanced in nuclear weaponry, domestic espionage, craft beer, and social networking, has not been able to resolve drought issues in Africa, Brazil, Ukraine, or California. In October 2010, at the edge of the Assad reservoir in northern Syria, we shared a picnic—lots of mezze & pastries—provided by our genial driver. Abu Hani was a Palestinian refugee, a survivor, having lived alone for several years while teaching math in Saudi Arabian middle schools in order to finance his household in secular Damascus. His wife would not live in Saudi Arabia. We haven’t heard from Abu Hani for almost four years now. This might be a place to share the information that in Saudi Arabia, our staunch ally in the noble fight against Islamic State barbarism, there were 79 public beheadings in 2013. The Assad reservoir is near the town of Raqqa, now controlled by the Islamic State, which sometimes prefers to bill itself as the more historically resonant Islamic Caliphate. A recent account of the consumption habits of the Caliphate’s soldiers found western products such as Pringles, Snickers, and Red Bull absorbing much of their $3 daily food allowance. Not mentioned was their appreciation of American brands of machine guns and tanks that they have confiscated from various Syrian rebel groups, “vetted” or not. Returning to Venice from Florence one day in November, I paged through an international paper. The top story was Obama in China. 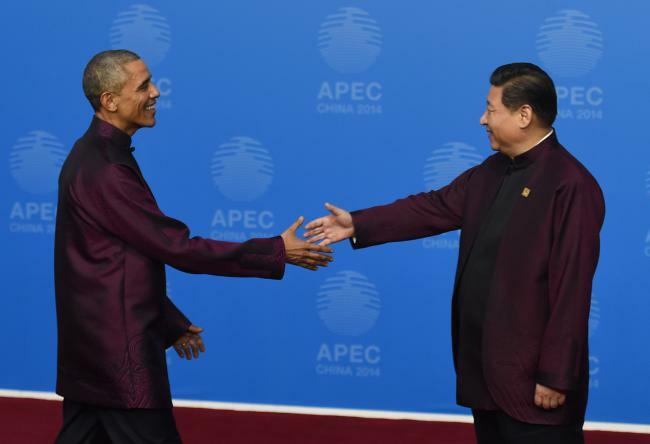 That night Italian TV showed Obama, lean and elegant in a mandarin jacket, coolly chewing a piece of gum as he strode across a stage to shake hands with President Xi. Maybe it was later that same night that the Italian Marco Polo (played by the impressive Marco Paolini) appeared onscreen. In any case, all this tended to eclipse an interesting op-ed on the historic drought in Isfahan. The writer suggested that western help in dealing with the drought problem could improve relations with Iran, where, as (almost) everyone knows, Isfahan is located. 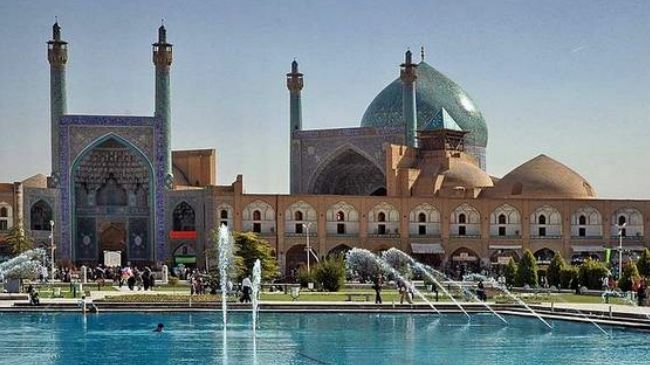 Isfahan, visited by Marco Polo in 1330, was a Persian capital known for its beautiful boulevards, covered bridges, palaces, mosques, and minarets. 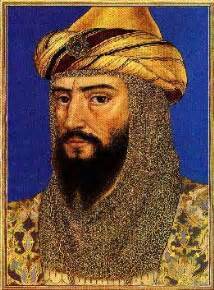 But, way of the world, in 1722 it was sacked by Afghan invaders and the capital was moved to Tehran. Today Isfahan still produces carpets and textiles, but also steel. 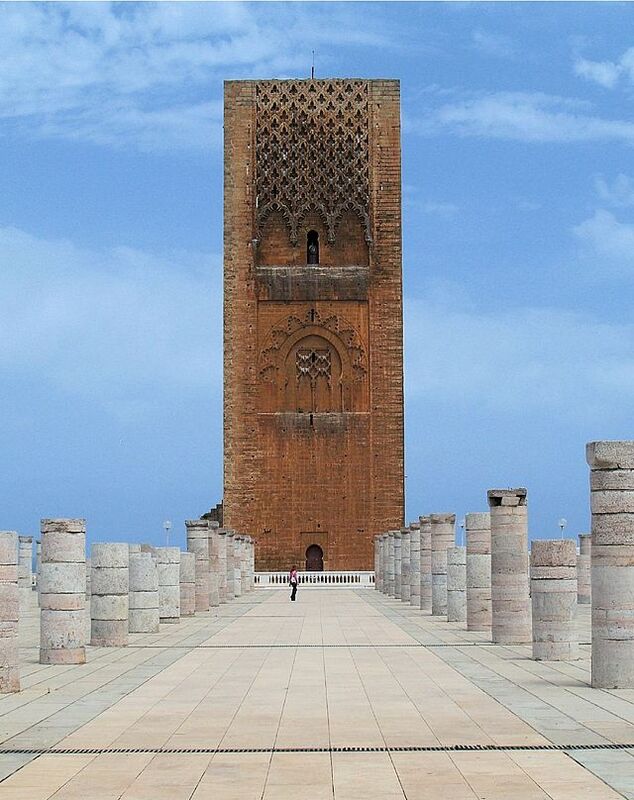 It has a major oil refinery and “experimental” nuclear reactors, as well as the largest shopping-mall-with-a-museum in the world (not to mention a top-notch chamber of commerce). But cosmopolitan twenty-first-century Isfahan is now suffering from an 80-year drought. When Venice was a major commercial center, expediting goods along the route to Isfahan and other Silk Road depots, the Dogana da Mar, the Customs House of Venice, controlled access to the Grand Canal and the San Marco docks. In 2007 Japanese architect Tadao Ando began a wonderful renovation of the space for use as a museum. “This building has been floating on the water since the 15th century, and my intention is to see it float into the future; it is a very old building and it was very difficult to study its history so as to preserve its original structure and innovate toward the future.” Since the extant building was actually built in 1677, one doesn’t feel that Ando’s creativity has been much hampered by his study of its history. 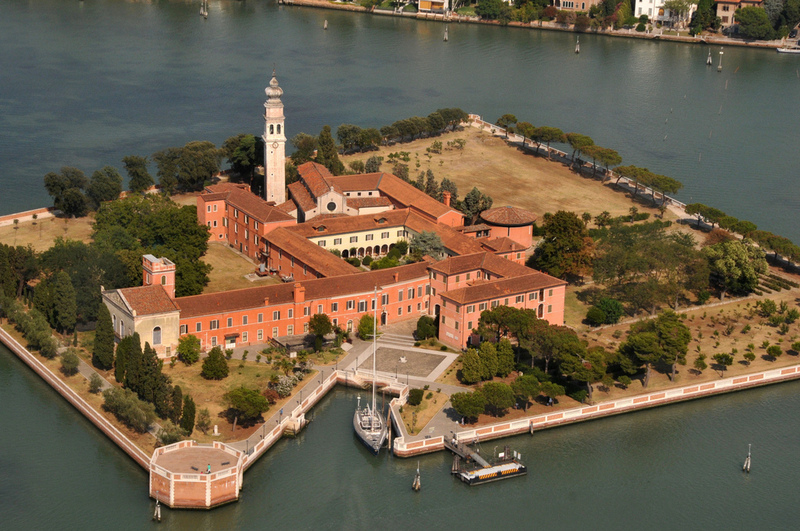 Meanwhile, the modest hydrographic station on the Punta della Dogana (the Doge’s Nose) still sends information to the Centro della Marea (Tide Center), which warns the citizens of coming inundations. .
One morning after our return to Berkeley, I looked out the window. The California drought was breaking in a big way and our street had become a flowing canal. There was a flash flood warning online, but a silent one.